Jest’s default value for its moduleFileExtensions option is ["js", "json", "jsx", "node"]. CRA was not using this option before version 1.0.8, so this default list was used. PR #2511 (merged in version 1.0.8) sets this option to ["web.js", "js", "json", "web.jsx", "jsx"]. The PR is about adding .web extensions, but it is also removing .node because it is not included like other default extensions. Packages using native code through node-gyp import files with .node extension. Using those packages fails the tests with a Cannot find module … error. This used to work with version 1.0.7. This repo is a minimal reproduction of this bug. Tests fail there. 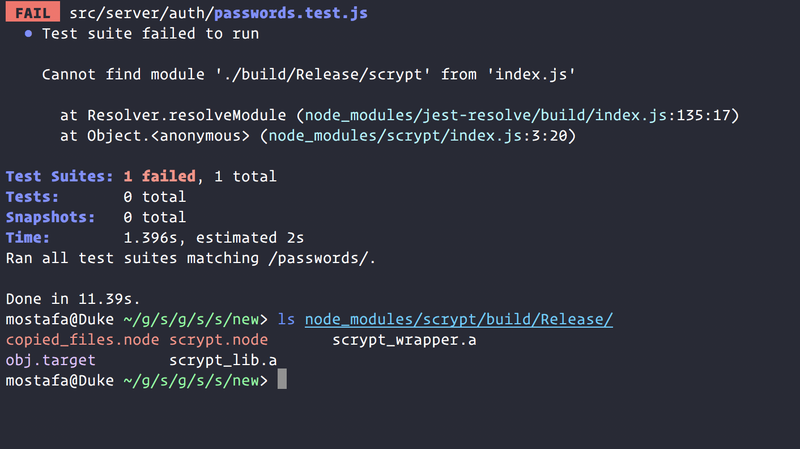 Changing react-scripts to 1.0.7 or manually applying this change to node_modules/react-scripts/scripts/utils/createJestConfig.js fixes the problem. Jest's default value for this option is ["js", "json", "jsx", "node"]. is missing one of default ones: "node". This change fixes that. This "node" extension is used in packages that use native code. I guess it’s reasonable to support this, even though it wouldn’t work with webpack. This is for projects that are using the same setup for the server. I have my backend code in src/server and take advantage of most of the CRA scripts for that. Hi. I tested react-scripts@1.0.11 and it works. The bug is fixed. Thanks for the release and the reminder. This is the same issue documented in react-script PR #2738 (facebook/create-react-app#2738), which has already been merged.